What a beautiful fresh morning after days of high humidity and distant rumblings we have had several spectacular thunderstorms. The first one while I was walking Mimi at the nearby lakes yesterday afternoon sounded like two lots of thunder vying against each other playing a game of “l can crash louder than you can!” However, the second one during the night was even more spectacular with the lightening ‘eclairage’ staying directly above and flashing over and over. Needless to say Mimi was not impressed. However, back to today, as the garden shows its appreciation for the rain after a long spell of dry weather and the perfume from the roses and honeysuckles drifts in the air, I yet again think how lucky I am to be in such a beautiful place. I read recently that there was a decline in songbirds in some French gardens. Absolutely not so here as there is a veritable cacophony of sound compounded by a couple of the hens bragging very loudly about the eggs they have just laid. I wish I was more proficient at recognising which delightful song belongs to which beautiful bird. Season ending and forward planning. It is with much chagrin that I begin this post and realise that I have not written a blog for months. I will plead gardening in the early part of the year and a busy summer with lots of new guests and a returnee family from last year. Again I feel very lucky that our visitors have been extremely nice and that they have enjoyed staying at Chez Mimi. Those with children seem to have especially enjoyed the garden and the pirate ship/playhouse. I have been totally entertained by the sheer imagination and scope of the games played and now realise that pirate vocabulary transcends many languages! Next year should prove exciting as the Tour de France starts on the 7 July 2018. The Grand Depart from Noirmoutier, (always a fabulous place to visit) will take the Peleton down the coast past Les Sables D'Olonne (of the Vendee Globe round the world yachting race fame) before heading inland to finish at Fontenay le Compte. The route passes within 35 to 40 minutes drive from Chez Mimi. The following day, Sunday 8th July passes within 5 kilometres taking in Les Lucs sur Boulogne, Beaufou, Palluau, La Chapelle Palluau and on to Aizenay before finishing at La Roche sur Yon. This provides an excellent opportunity for picnicking nearby and supporting your favourites riders and teams. The following two days are also within driving range with a team time trial at Cholet and a day's stage starting at La Baule (another beautiful place to visit) going into Brittany. Meanwhile we are moving towards Autumn. We have had a very hot dry summer and the leaves are beginning to turn. It always seems very strange how the seasons are just that bit ahead of the UK. In my head, August is haymaking time but here most of it was done and dusted in June and July. Any time now we will be hearing the machinery at the Cave, across the road, begin the process of making the various local wines after the Vendage. I hope that you have had a pleasant summer period too! In my defence I have been very busy knitting for The BAY Foodbank in North Tyneside. During my last visit to England I went to see "I, Daniel Blake" with my daughter. She was so moved by the film that she launched "We, North Tyneside" as a response and supported by my other daughter and a friend has created a movement that has created quite a stir and even got the support of Ken Loach the director, one of the actors, Kema and Jackie, a founding member of the food bank. (She was also in the film.) Twenty schools and various local businesses including a hospital and art gallery have come on board. A huge amount of money has also been raised and will be used in February to buy more foodstuff and essentials. We are hoping that this incredible support will continue long after the Christmas festivities have faded away as sadly, poverty and need will not disappear so quickly! I have mixed emotions about this as I couldn't be more proud, but I am angry and frustrated that we have such need in this day and age. Meanwhile back to here and now I want to take the opportunity to thank all of our visitors to Chez Mimi. It has been such a pleasure to meet so many lovely families and friends and I take pleasure in the lovely notes in our visitors" book and such positive feedback from the various booking sites. I also am happy to welcome our new visitors for 2017 especially our lovely returning Welsh family and I look forward to catching up next year. It only remains for me to wish everyone a Happy Christmas and the hope that the New Year will bring peace and renewed optimism in these less than tranquil times. It is difficult to find enough superlatives to describe what a fantastic summer season we have had here at Chez Mimi. The weather has smiled on all our visitors both in my house and in the gite. The garden has echoed with the sounds of happy voices, children playing and shrieks of laughter from the splash pool. There has been competitions galore in the garden play area, with outdoor chess, boules and a game called either Mokky or Kubb (or even just the stick game) where you throw a baton at wooden numbered blocks. My grandsons have improved their mental arithmetic whilst writing up the scoreboard. The pirate ship has weathered the storms of daring pirates sallying forth with their "daring do's" (and occasional don'ts!) Even parents have been spotted donning the pirate costumes and getting their photos taken to capture the moment! We have had many guests from a variety of countries, Italy, Belgium, England, Wales, Ireland and of course from various areas of France. It has been a privilege to have met such lovely people and enjoy passing time with them and finding out where they have spent their time locally. I have picked up a new set of favourite places and ideas for future guests and my family too. Here at least we can be truly European and welcoming! I am delighted to say one lovely family have rebooked for next August and we already have a couple of other bookings for 2017. We feel like we will be welcoming back extended family members! Our visitors book has been a delight to read and we have been overwhelmed seeing the lovely comments. You can see copies of these on our reviews page. It is gratifying to recognise that guests have felt comfortable and relaxed in Chez Mimi and that all that I had hoped for when it was being designed and built has come to fruition. The weather is still glorious - the garden less so sadly but I am sure that it will regenerate itself when the rain finally comes. Well if you are anything like me and are still reeling with shock at the recent and ongoing events back in the UK, you may be pleased to know that Europe still offers a haven for holidaymakers ready to escape the pressures and worries of everyday life. The garden here at Chez Mimi is beginning to come into its own and listening to the birdsong is a tonic in itself. The pool is ready, warming up nicely ready for guests to soak up the sunshine, have some fun and fill the place with laughter - a much needed tonic. Blue skies, sun, excellent wines and good food are here ready to give you that much needed respite from the doom and gloom and enabling you to return fortified and ready for whatever the future may bring. It has been a while since I wrote a Chez Mimi blog and this is because I have been otherwise occupied visiting relatives both here in France and back home in England. I was recently invited, by my lovely cousin Philippe, to visit him in Bordeaux and as I love spending time with him and had never been there before, I accepted with alacrity. He duly collected me one Friday evening, en route from Nantes and we set off for what was an absolutely fabulous weekend. That first evening was spent enjoying fabulous food in a lovely restaurant on the Quai by the Port of the Moon followed by a beautiful stroll around this stunning city. 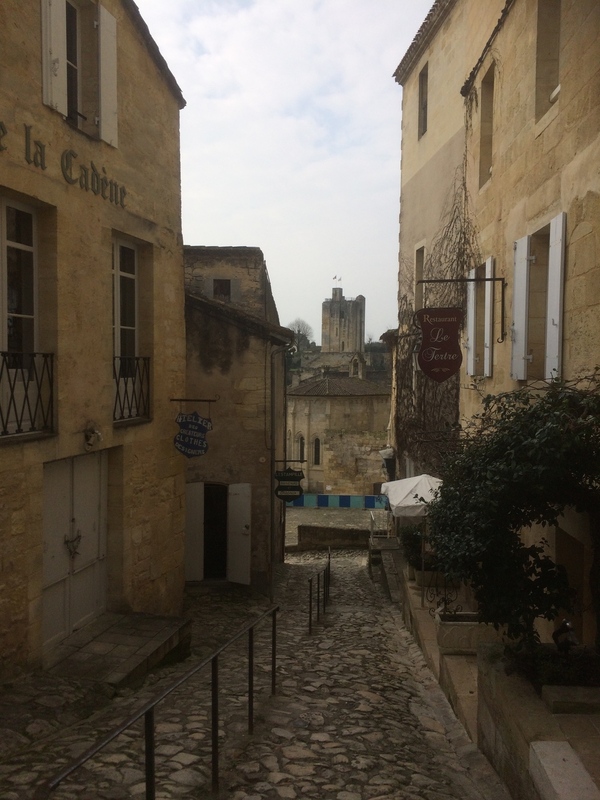 Saturday, saw us visiting St Emilion and exploring this lovely historic area dating back almost 2000 years. It is built out of local yellow limestone, although its streets are paved with stones used as ballast from visiting English ships, obviously it was important to ditch them in order to fill up with all the beautiful wines! I loved the atmosphere and thoroughly enjoyed the visit to the chapel. I think I understood most of what the guide was saying and of course Philippe was on hand to clarify any areas of uncertainty. The next day we visited the quayside market, en route Philippe showed me his local boulangerie, the bread is delicious and the shop oven needs to be part of a film set. I was particularly captivated by the cheese stall, so beautifully arranged that it was almost a shame to disturb it by buying the fabulous produce. The rest of the day was spent exploring this fascinating city and being tempted by some fabulous chocolates and a cheeky glass of wine. It would have been rude not to!!!! Sunday was spent exploring Cap Ferret and trying to spy the largest dune in Europe. Although the weather was warm and pleasant visibility was not so good. "According to legend, the fairies were driven from the forest of Brocéliande. They shed so many tears that they created the gulf of Morbihan and into this they threw their flowery crowns and so were formed the 365 islands of the gulf. Three of these coronets escaped unnoticed from the little sea and formed Houat, Hoedic and the most beautiful, Queen of the fairies - Belle Ile." Having had an absolutely fabulous time yet again, I had barely time to touch base, check on Chez Mimi and take off for a Granny visit and as it was half term I got to spend a few days, with them, in sunny, stunning Alston in Cumbria. A highlight was the visit to Kilhope Mine. The underground visit was thoroughly enjoyed by the youngest member of our party, but much less so by his older brother, who showed his courage by seeing it through! The finding of treasure and a visit to the play area soon restored his equilibrium. On the recommendation of a friend, we went to explore a very beautiful garden centre named Larch Cottage. What a beautiful place full of interesting nook, crannies and stunning plants guaranteed to inspire creativity. Added to this, their cafe served totally delicious food - we were lucky enough to be on the sunny terrace, with a lovely view and surrounded by stunning wisteria. However, all good things must come to an end so I am back in the Vendee with glorious weather, tending to the garden, adding the last few touches to Boaty Mac Boathouse and polishing up the gite for our summer visitors. It all began from an idea. A couple of years ago Gerry built a lovely little playhouse in the garden, which was well received not only by my grandsons (aged 4 & 5,) but also little visitors to Chez Mimi. However, at Christmas I looked at my boys and realised that they had become mini giants and that unless they took a shrinking pill the doorway may pose a problem. I began a tentative conversation with Gerry along the lines of what if we took down this playhouse and built a bigger one. The idea was well received so many days of planning ensued and finally we had a more or less final version. The plan was to build two rooms, one as a summer house for the adults in need of a quiet peaceful place to sip their wine and the other as a play area with an upper floor. The play area would be designed as a ship, but each floor would be high enough for older children to stand up. An internal staircase leading up to the map room and bridge (poop deck) with slide (gang plank) as the exit. We decided to use as much recycled material as possible and managed to find some excellent windows and doors from the site "Leboncoin" (highly recommended.) Additional windows were supplied by friends and with everything underway I duly departed for England as half term Granny. When the boys were here for Easter they had a marvellous time helping with finishing off jobs - hammering, drilling and sawing. Daddy and Mummy were not with us due to work commitments so didn't need to be aware of any potential risk factors! During one lunch time we got around to the naming of the new playhouse. Of course it wasn't that simple as one said "Boathouse' and the other said 'Houseboat." So until a better suggestion comes along we have followed our esteemed boat namer and we have "BoatymacBoathouse." There are still a few small finishing off jobs, but our current guests have two little ones, who have had great pleasure in running in, ascending the stairs and whooshing down the slide brandishing some very scary cutlasses! My brother and his wife are arriving for a visit next week - we may have to have a launch party!!!! Happy Easter thoughts to all our Chez Mimi guests, past, present and future. Voyager avec de jeunes enfants...comment survivre l'experience? Voilà, c'est enfin l'heure des vacances. Je me vois déjà lire un bon livre au bord de la piscine, le temps que mon mari s'occupe de nos trois jeunes enfants (on peut toujours rêver, non?). Mais entre moi et cette piscine, il y a des centaines de kilomètres. Et pour y parvenir, il va falloir faire le trajet avec nos chères têtes blondes. Que ce soit par train, voiture ou avion, la clé d'un trajet heureux, c'est d'être super organisé mais aussi et surtout, de ne pas s'attendre à un miracle. Ce ne sera jamais parfait. Avec mes filles de quatre et cinq ans, c'est facile. Leurs petites valises remplies de coloriages, cahiers de vacances et livres, et je ne les entends pas pendant au moins deux heures. Lors de trajets en avion, je leur donne aussi des bonbons au décollage et à l'atterissage pour aider avec leurs petites oreilles (je m'excuse auprès des lecteurs dentistes). Auparavant, lorsque nous voyagions en avion/train, j'avais toujours la hantise de déplaire aux autres passagers. Maintenant, disons que je n'ai plus vraiment le temps ou l'envie de regarder autour de moi et de remarquer les regards de travers et les sourcils fronçés. Je refuse de me sentir coupable de voyager avec de jeunes enfants. Après tout, mes petits aussi font de leur mieux. Ils ne comprennent pas toujours pourquoi nous devons rouler pendant cinq heures, pourquoi il n'est pas possible de crier comme à la maison ou pourquoi les oreilles font mal en avion. Allez, on ferme les yeux, on inspire, on visualise cette piscine et ce bon livre (et accessoirement ce bon Martini). On y est presque. Bonnes vacances! Are we nearly there yet? Travelling with young children...how to survive! Here we are! Finally, it's holiday time. I can already picture myself reading my book by the pool while my very helpful husband plays with our three little terrors (well, I can always hope, right?) But between the pool and me, there are a few hundreds miles to travel. Which means, we will have to travel all the way there with our oh so lovely and well-behaved children. Whether it's traveling by plane, car or train, the key to a peaceful journey is to be well prepared, but also and mainly not to expect a miracle. It will never be perfect. With my 4 year old and 5 year old daughters, it's relatively easy. I just fill their little suitcases with crayons, crafty things and some books and we are unlikely to hear them for 2 hours. When travelling by plane, I also pack some sweets to give them at take off and landing to help with their little ears (apologies to any dentist readers). For my 2 year old son, I just pray really. He never falls asleep in a plane and rarely in the car. His dummy works for about a whole 5 minutes (see previous apologies). The only thing that seems to help every time is food. And a lot of it that is. Therefore, I fill his little suitcase with bananas, chocolate, biscuits, sandwiches, crisps, raisins...anything goes. I used to get self conscious when travelling with the little ones, always hoping not to displease other passengers. Nowadays, especially as I sometimes travel on my own with them, I don't really have time to care as much. I'm sure there must still be the annoyed looks, tutting and sighs but, I must say, I don't give it much attention. Children don't necessarily always understand why they have to sit in a car for 5 hours, why they can't shout in the train like they do at home (and they do a lot of it) or why their ears sometimes hurt in a plane. At the end of the day, they are children. So close your eyes, take a deep breath, visualise yourself by the pool with a book in one hand and ideally a white Martini on ice in the other. And yes, I promise we are nearly there. Happy holidays! Ah la Chandeleur! Que de merveilleux souvenirs d'enfance à préparer la pâte, se battre pour être celui à faire sauter la première crêpe ou être celui à lécher la cuillère du pot de Nutella. Cette année encore on anticipe avec impatience. On en oublierait presque son sens. Cette fête religieuse bien ancrée dans la tradition française est en fait la commémoration de la présentation au temple de l'enfant Jésus, 40 jours après Noël. A vous, chers passionnés de cyclisme? Ah le plaisir de faire du vélo en Vendée. Il y a tout d'abord cette merveilleuse invention qu'est la Voie Verte. Cette liberté d'explorer la région à vélo. Ce plaisir de découvrir de nouveaux paysages sans avoir à se soucier du trafic. La voie verte ne cesse de se développer depuis les années 1970 en utilisant principalement des anciennes voies ferrées et chemins ruraux. De multiples circuits sont disponibles depuis Chez Mimi : le circuit des Lucs sur Bourgogne, celui de Froidfond ou encore celui de Maché. Pour les amateurs de cyclisme, notez dans vos nouveaux agendas la 39éme édition de Cholet Pays de Loire les 19 et 20 mars. Différentes courses sont organisées, de 60km à 190km. Et bien-sûr à ne surtout pas manquer, le Tour de France 2016, qui cette année passera en Pays-de-la-Loire, avec une arrivée à Angers le lundi 4 juillet et un départ à Saumur le mardi 5 juillet. Parfait pour partir à la journée de Chez Mimi et encourager les coureurs cyclistes. The 4th December marks another fascinating French tradition as towns and villages across France prepare to celebrate la Sainte-Barbe. And as I have just discovered as a new villager, Saint-Etienne-du-Bois is no exception. Sainte-Barbe, a young woman believed to have lived in the 3rd century, is thought to have been a martyr who, after being tortured with fire for becoming Christian, was executed by her own father. As a punishment, he was struck by lighting and consumed by flames. Yes, a little bit dramatic. Sainte-Barbe is now known as the patron of all workers who use explosives such as artillerymen, military engineers, miners, and, most famously, she is the protector of firemen. Today, in Saint-Etienne-du-Bois, we gather at a ceremony held at the Fire Station and dance at the Firemen’s Ball in the name of the Sainte-Barbe, hoping she will continue to protect our firemen...and mostly toasting to her. Santé! Exploring these old traditions has spurred us on to start preparations for Chez Mimi's first Christmas and guests. Let's hope that they enjoy seeing the Christmas tree with its fairy lights and decorations as much as we do! Well one would think that after a hectic summer, life would settle down to a quiet routine. Time for pottering in the garden, sorting those pesky little jobs that have always somehow slid on to the back burner and generally meandering towards Christmas preparations and visitors. Not a bit of it. The machinery is still thumping away at the Cave preparing all that delicious new wine. The tractors are still passing backwards and forwards carrying hay bales, crops and winter fodder. This lovely sunny Sunday morning has had the peace and quiet shattered; firstly by at least 100 hundred motor bikes doing some sort of cross country trek. I am still trying to work out where they were heading for as they were using the back roads from Lege going towards Grande Landes - who knows? Then about half an hour later sheer utter excitement as a huge procession of veteran and vintage cars of all shapes and sizes waving and hooting as they passed by Chez Mimi on route to .....? However, one person has certainly settled for the quiet life. This lovely little caravan named "Vita Pura" stayed a couple of nights next to the lake at Lege. The horses were beautifully groomed and he seemed to have his life pared down to the minimum save for one concession to modern life. I noticed he had pegged out a solar panel to catch the sun and generate enough power charge his batteries at least. Ah well back to creating enough space in the freezer to store the blanched french beans.